Brandon Bridge could be making his first career start in just his second career game in the CFL for the Montreal Alouettes. The injury news for quarterbacks Jonathan Crompton and Dan LeFevour wasn’t good on Friday. 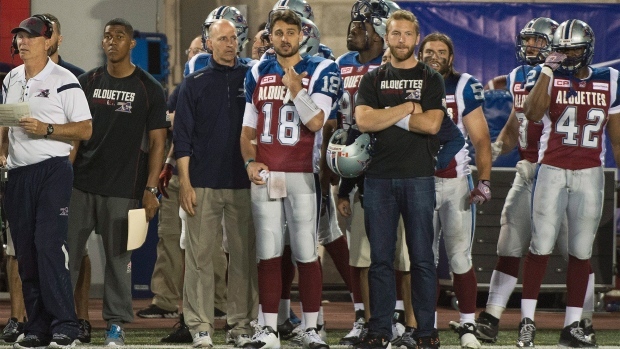 The Alouettes released a statement saying Crompton has a shoulder injury and is day-to-day as he awaits results. TSN's Dave Naylor reports he's unlikely to play next week. LeFevour meanwhile, has a dislocated shoulder, is due to undergo surgery, and could miss the rest of the season. Both Crompton and LeFevour were injured in the Alouettes’ season-opening loss to the Ottawa Redblacks on Thursday.